There is a time for expansive, creative thinking. And there is a time for editing, for removing things. Sometimes, less is more. Noise detracts. 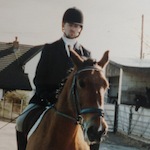 In dressage, I learned that looking where you want to go is hugely important and I believe that the same principle is important for people, teams, and organisations. Where you look, you go.